Sometimes when you travel unfortunate things happen. For me on my most recent trip abroad, this was getting a really bad cold and trying to figure out how to recover when I'm so far away from home. It's difficult because more often than not, I'm staying in hostel rooms with anywhere from 3-20 other people and that makes it a bit awkward to try and recover in. But when I needed it most, St. Christopher's Inn: Liverpool Street was there to save me in my hour of need. Tucked away about a five-minute walk from the lively Liverpool Street station in London is this lovely hostel and pub combination accommodation and it was the perfect place to recover from my debilitating sniffly nose. Upon arrival at the hostel, I was a bit early and the friendly staff allowed me to store my bags safely before I headed back out for a few hours into the great neighborhood of Shoreditch in the East part of the city. I had just arrived via plane from Lisbon so I was extremely tired and when I came back to check in, I was about ready for a nap or at least a rest and hauled my baggage upstairs to my room. I wasn't expecting what I had found there. When I opened the door to my ensuite digs, I was extremely excited. Not only did I have a huge, comfortable bed waiting for me to melt into, but the room was fully decked out in all my Anglophile dreams. This immediately made me feel right at home and in the right place. Other amenities included my own bathroom with a shower with two heads, towels, a mini-fridge, AC, a hot water kettle with tea and coffee, and a TV with British cable so I could get a taste of what the English watch while relaxing. I would've screamed with joy but I was too tired to, so I immediately set all my stuff down, took a much-needed shower (previous to this I was in a hostel with only one gross shower to be shared amongst over 25 girls), and changed into my pajamas so I could get under the covers. Of course, after doing all of this I realized I should probably actually go out and get some food and cold medicine so I could recover more quickly, so I told myself I'd get some work done and rest a bit and then go out later to forage for necessaries. After getting back in the evening, I took an early night and slept like a baby. On the morning of the first day, I slept in too late to take advantage of the breakfast, but I allowed myself to sleep in the amazingly comfortable bed and relax so I could improve myself for the days to come. On the second and last morning, I made it to breakfast just in time before they put it away. It was a nice, typical hostel breakfast with toast, cereal, tea, coffee, fruit, and juice. What made it lovely though was getting to sit in a pub and eat and soak up the atmosphere of an English spot. I wish I hadn't been sick so I could enjoy more of the pub, such as their drinks or friendly bartenders, but next time I'm in London perhaps I'll have to swing by just for a pint so I can experience that aspect of the hostel I missed out on during this trip. One of my favorite things about this hostel was the location. Shoreditch is my absolute favorite area of London and I can always find new things when I'm there. 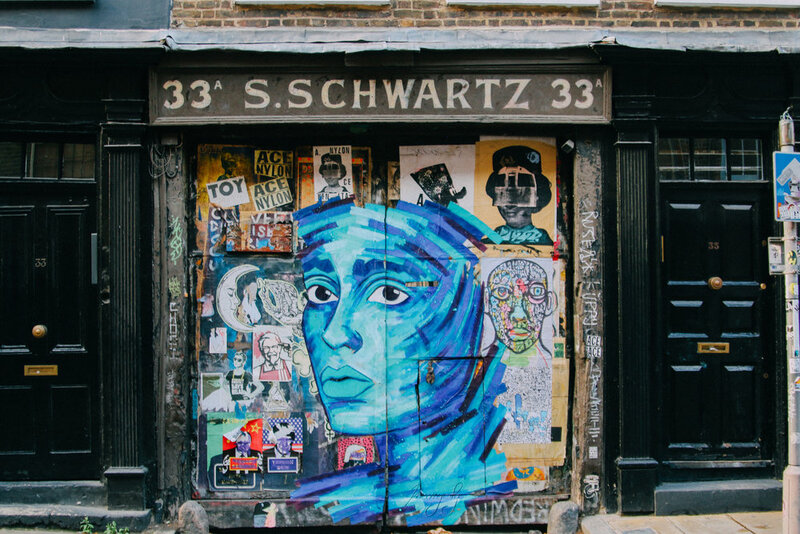 The best street art, markets, food, and oddities lie here and it's total Instagram goals. 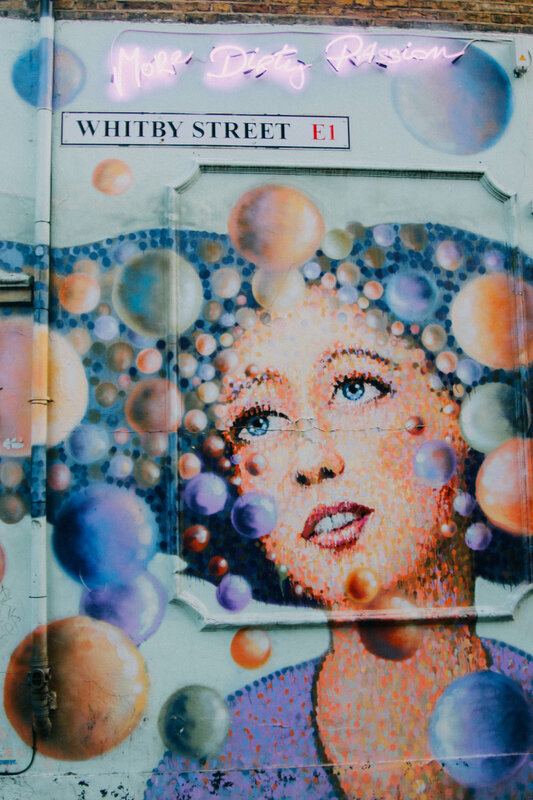 Brick Lane, Old Spitalfields Market, Columbia Road Flower Market, and Boxpark are some of the best places to explore. You can also find Lady Dinah's Cat Emporium, an adorable cat cafe. Two of my favorite coffee shops, Shoreditch Grind and Aida, are also in the area. It's extremely worth a long walk around to see what you can find. 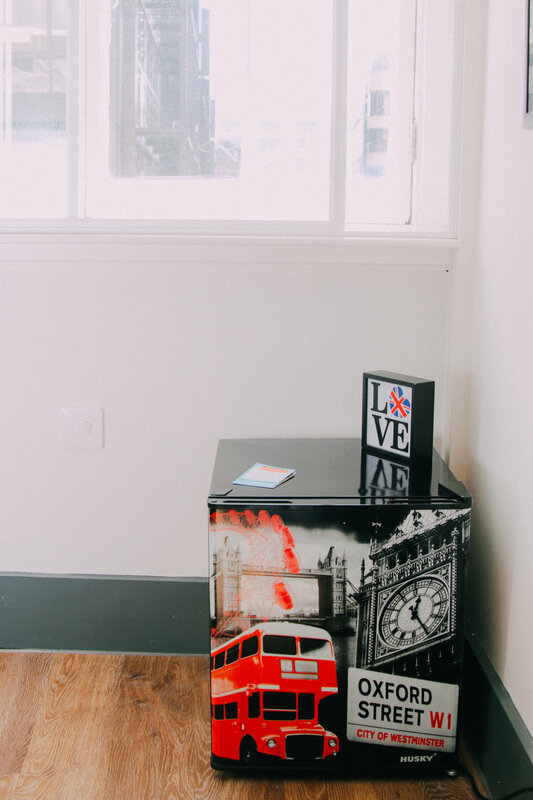 St. Christopher's Inn: Liverpool Street is a great place to stay for budget travelers and couldn't be in a more perfect location for those who like the grunge of East London. And if you book your room directly through their website, you also get free unlimited continental breakfast included in your stay! Guests of the hostel also receive a 25% discount on food at the bar and 2-for-1 drink specials. There's a mixture of ensuite and multi-person pod-bed rooms, so you can choose whatever is most comfortable for you. And the best part is that many locals frequent the pub downstairs, so you'll always have a good mix of fellow hostel folk and Londoners to schmooze with. Disclaimer: I was a guest of St. Christopher's Inn. All opinions are my own.